If your district is similar to mine, sometimes new class materials aren’t always available the first thing in August. I felt like I was teaching a ELA course with no books. So yeah, I could make due for the first month, but it really was a lot of making it up along the way. Rodrigo Delgado and Trey Baker check the drone out before flying. Basic concepts in aviation, mathematics, and technology were important starting out. For a very right-brained learner, it actually turned out to be fun to see how these all work together. I felt proud of myself for teaching a subject with more than creative production. Drone class is day-to-day based on the weather. Towards the end of the semester, the weather was more volatile. It became harder for us to find days to film with the drone. Be ready to be flexible with film schedules. Avoid using a drone as a fad tool. Don’t get stuck on the idea of using your drone just because you have it. Aerial shots are quite often used in the beginning of a film, a part of a movement in a scene, or for the ending shot. Try to have reason for how you incorporate into your production. As a photographer, maximize your resources across your journalism department. Create forms for newspaper and yearbook staff to fill out a request for a drone photo to be used in an upcoming story. Have them submit it to your students for them to see how they can be a supporting role. Focus on the actual types of shots or movements used in drone photography. We worked with Wondershare Filmora tutorials on Drone Production. The video titled “10 Drone Video tips to Film with Drone Like a Pro!” gave specific definitions and examples how you can diversify your film production other then shooting top of buildings. To break up the flight schedule, we reviewed articles once a week to look at ethical issues in filming with a drone. Articles from Time Magazine and Scientific America were helpful. You may even be able to find some in your local news outlets. Topics deal with privacy laws, use in multiple industries, and how local law enforcement agencies use drones. On other days, we used a video or photo of the week submitted by students. I love looking at the hashtag #drones on Instagram because it can lead you to unbelievable photos and the industry leaders who I can use for contacts. Bring in a speaker. 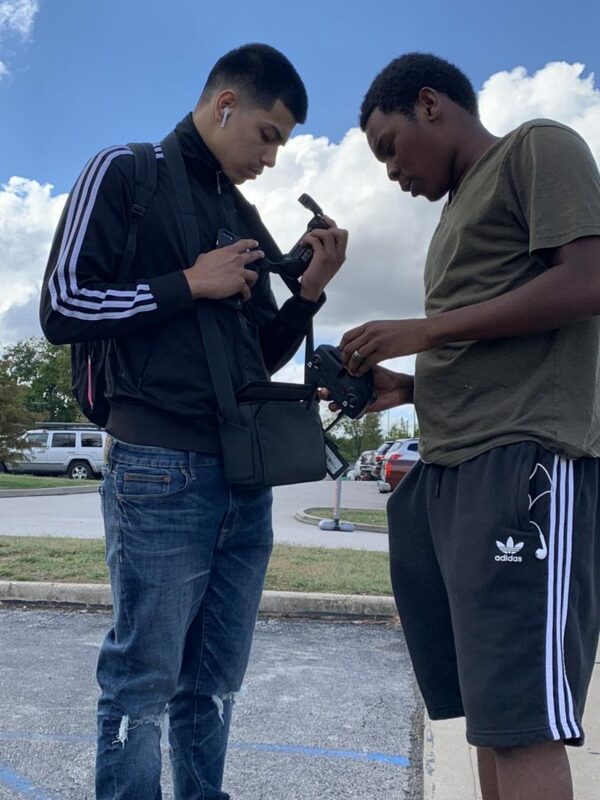 We contacted a local photographer from a news outlet who was happy to share his experience dealing with the laws of flight, difficulties in his job and examples of how he incorporated it into stories for fellow reporters. Students loved seeing the type of drone he incorporated into his job. Overall, we had some hits and misses with the course. It was to be expected in our first year, but I also found great joy in seeing some of the students shine in the work. Very informative. Thank you for sharing. Now, for a couple of questions: 1) How do you incorporate FAA regulations regarding drone usage into your class? 2) How have you addressed your school district’s liability concerns? Thanks for the questions Mark. We weave the FAA regulations throughout the course. We start with the basics early on and work are way through the test specifics from air space, using air maps, hobbyist vs commercial once a week. Students present a presentation on flight laws and regulations at the end of course. With regards to liability, my superintendent and I reviewed our school districts insurance policies very early on. The insurance company had written in a section for coverage of drone usage.